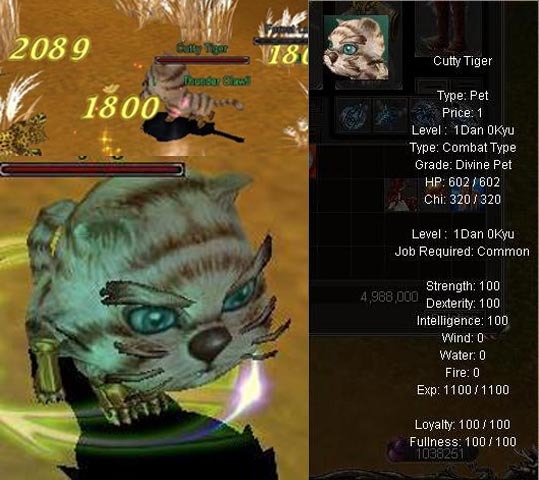 Cutty Tiger Differentiated in design from an ordinary pet, Event Pet Cutty Tiger. 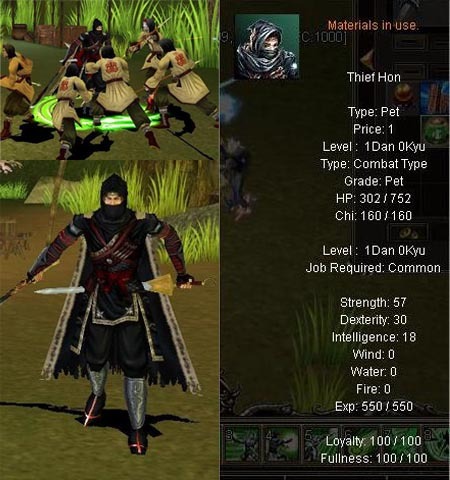 *Characteristics : Level restriction is 1 Dan 0 Kyu, and players must level it up from 1 Dan 0 Kyu. You can use it by equipping it on the pet slop and clicking the Pet/Reinstate button. Young Jin Differentiated in design from ordinary pets, Young Master Jin takes a form of a young human child. *Characteristics : Skill usage rate and effectiveness is regular, and it evolves 3 times in total. Level restriction is 1 Dan 0 Kyu, and players must level it up from 1 Dan 0 Kyu. You can use it by equipping it on the pet slot and clicking the Pet Revive/Reinstate button. 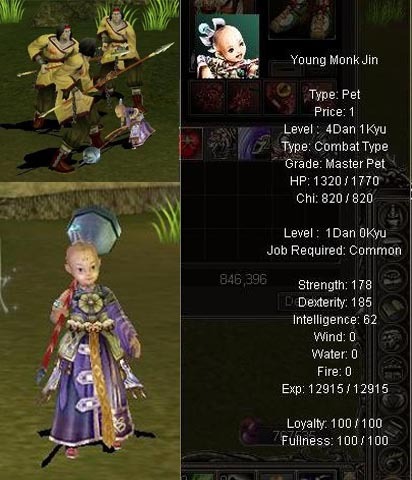 Apprentice Ryung Differentiated in design from ordinary pets, Sword Master Ryung takes a form of a little girl. *Characteristics : Skill usage rate is low, but effective. Evolves 3 times in total. Level restriction is 1 Dan 0 Kyu, and players must level it up from 1 Dan 0 Kyu. Thief Hon Differentiated in design from ordinary pets, Assassin Hon takes a form of a male assassin. *Characteristics : Skill usage rate and effectiveness is both high, but heal effectiveness is low. Evolves 3 times in total. Level restriction is 1 Dan 0 Kyu, and players must level it up from 1 Dan 0 Kyu. 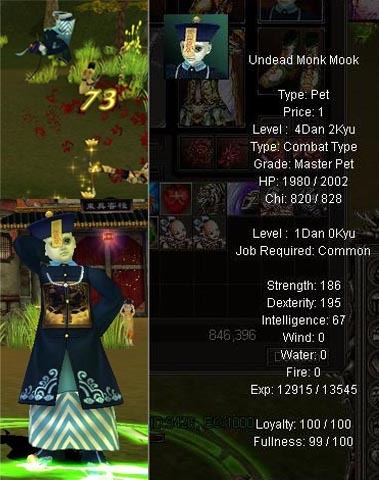 Undead Disciple Mook Differentiated in design from ordinary pets, Undead Priest Mook takes a form of a young undead child. *Characteristics : Skill usage rate and effectiveness is regular, and it evolves 3 times in total. Level restriction is 1 Dan 0 Kyu, and players must level it up from 1 Dan 0 Kyu. Eyeball of Golden Dragon "Increases experience gain of your pet when training with your pet out. 'can be aborted by right clicking.' Time : 800 mins (Time is used only when the character is connected). Click the right button on the mouse to use. To abort, right click while in use." When you place the item in the quickslot, an information screen will appear on the bottom center. (minimum consumption of 200 when used)"
Strongsteel Canine Tooth This item is used for a pet to increase the HP to +200, Damage to +200~250 and Skill Damage to +500~600. Right Clicking on the item will move it to the pet armor slot. Strongsteel Armor This item is used for a pet to increase the HP to +400, Defence to +100 & Skilldefence to +1000. Used to tank the damage of higher level monsters. Strongsteel Fang This item is used for a pet to increase the Damage from +50~100, Defense to +100 and Skill Defense to +500. Ghost Dagger Chest(1~7) On opening this box, you will get a Ghost Dagger from 1-7 used to strengthen the pet armor. Use this item to craft from any blacksmith. Dragon Scale Chest(1~7) You will get a random Dragon Scale from 1-7 which is used to strengthen the Pet Armor.